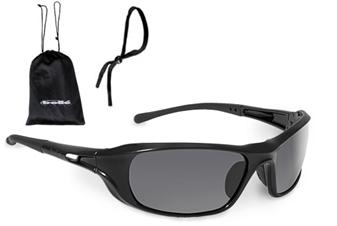 Bolle Shadow #40060 With Smoke Gray Anti-Fog And Anti-Scratch Lens. 2.00 mm high impact polycarbonate lens. Close fitting, high contour design for improved eye protection with distortion free viewing and superior optical quality. Optimal fit and comfort with rubber temple tips and a non-slip fit. Rubber nose pads. Supplied with soft pouch and adjustable cord. Meets ANSI Z87.1-2010 Standards.